The screaming east wind had his wicked way with us all at our Beltane ritual- wild, cold, elemental and magic. We tripped over our cloaks and the fire tried to attack us as we raised a circle. We stayed until the witching hour, left the woods as we had found them and thanked the unseen friends who had joined us – another mememorable night for Blackthorn! Witchcraft is not just about spells and ritual and its great to return to the land and our source and there is no better time than at harvest. 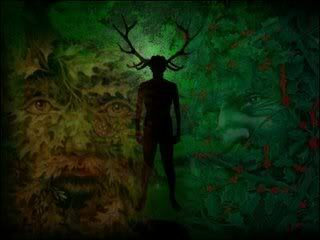 As pagans it is far too easy to be carried away with the mystical aspects of our path and thus lose our physical connection to the land and its offerings. In a quest to be greater connected physically we decided we would go out in the sun this afternoon to harvest Blackberries for jams and wines. After suffering stinging nettles, blackberry bush thorns, and some mushy blackberries stains, we left with around 2lb of fruit in carrier bags . We will also turn our attention to the Blackthorn Sloes which appear to be coming ripe around Tameside. Apparently they are early this year and whilst it might be best to wait until first frost they will be added to Gin with a raft of sugar and should be ready just in time for Yule. All things being equal the Blackthorn Coven at best will have plenty to drink at our rituals! !